« Silkscreened Burgertime Glass Bezels – ready for pre-order! 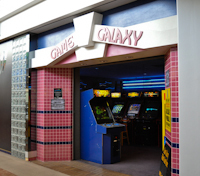 Events > Game Galaxy Retro Arcade Museum Grand Opening! Game Galaxy Retro Arcade Museum Grand Opening! Many times the hype of classic gaming events can exceed what is delivered, but this wasn’t one of those times. I was really impressed with both the arcade and the museum (for different reasons, though.. more on that in a few paragraphs) as they both had very distinct personalities and the selection of games and the contrasting atmosphere in both really set differing tones to enjoy the games that were in each location. I’d say that 90% of the video games in the two areas were fully operational, and that was highly impressive in and of itself. Come to think of it, every pinball that was in both areas was 100% operational and working great. What was so great about the arcade was that it was truly what we would all remember an arcade to be like… dark, blacklights, neon, loud attract-mode sounds, muted music, pins, vids and a dude at the counter that couldn’t make change for anything bigger than a fiver…. seriously. Fortunately the change machine worked fine and I had plenty of singles. With quarters in hand, I proceeded to make my way through the rows of machines. From the perspective of the front door, the right side of the arcade was dedicated to more of the classics (Donkey Kong/Jr., Pac/Ms. Pac, Galaga, Burgertime, Gyruss, Track & Field, etc.) and the left side of the arcade was dedicated to pins and Dynamo/Candy cabs. I did several rounds through the arcade and was able to score some play time on most any machine I wanted and reacquainted myself with several oldies that I hadn’t played in some time… Super Pac, Duck Hunt, Q*Bert, Hogans Alley and Super Punch-out probably being the most notable of the bunch. One great find of the vids was Gaplus (Galaga 3). I had never played this BITD (Back In The Day) and I was hooked from the first quarter in. I think I probably pumped well over 5 bucks into this game and had a blast with it. It was so much fun, because it was everything I love about Galaga with none of the drawbacks and (sometimes) monotonous gameplay. Gaplus was fresh, challenging and really fun to watch and listen to. I want one for my game room. On the other side of the arcade were the more contemporary/fighting games. Seeing as how I really couldn’t care less about most Dynamo and Candy cab games, I passed them up and moved over to the pins. There were some of the perennial favorites like Adams Family, Elvira, Bride of Pinbot and Guns&Roses, along with newer titles like Fish Tales and TRON. Yep – TRON! This pin was so much fun and such a treat to watch and listen to. I spent lots of quarters on this baby, and had a blast with each one of them. I’d love to have a TRON pin here at home. Needless to say, I was VERY pleased with the arcade… a good mix of old and new and pins and vids and more then enough to keep any retro fan happy for hours. With some good play time in the Arcade under the belt, it was time to head over to the museum area. $10 at the door buys admission and the privilege of playing any of the working games as many times as desired. After paying up, I did a quick walkthrough and was wholly impressed with the expanded game selection over and above what was in the arcade. There were rare and hard-to-find titles like Zookeeper and Zwackery, as well as some less-often-seen titles like Jungle Hunt, Black Widow, Bosconian, Gorf, Spy Hunter, Star Wars, Food Fight, several Exidy shooting games, most any laserdisc game you can think of, an expanded Nintendo Row (with DK3 – which I played for the first time and I absolutely love the game), Tapper, Satan’s Hollow, Tron & Discs of Tron, Zwackery, Journey, Hyper Sports, i Robot, Gauntlet and the list just goes on and on. There were a few more pins like Terminator 3 & X-Files, but the pin selection was overshadowed by the vid selection. No worries, as the pins were well-represented back over at the arcade. Outside of the awesome title selection, there was also a corner of the space set up for console tournaments. It was neat to see everyone getting into the action and making some noise on some of the tournaments, as it lended a sense of ‘crowd enthusiasm’ to the place and that was neat to have as backdrop noise. As lively as that was, having so many people huddling around a small space and having both the console tournaments and the arcade museum going on in the same space seemed to put each group at odds for what little fresh air was floating though… take ‘less than perfect’ hygiene on some of the attendees I saw, add in little-to-no air movement and mix that combo with the musk of 30+ year old cabinets and I think you get the drift. While I appreciate the need to use what space was there as best possible, I hope they can straighten up the clutter of the museum area, possibly install a few fans and move the console tourneys to their own dedicated space. Once that happens, they will be cooking with fire and conditions should improve significantly. I feel that it would create a much more enjoyable experience all the way around for both groups. I absolutely LOVED playing the games in the ‘museum’ but found myself constantly going back to the arcade because the breathing conditions were so much better. All-in-all, I have to give a lot of credit to DreamTR and the rest of his staff for what they’ve got going on. The sheer selection of games and pins was pretty amazing and the fact that they are actively supporting the retro/arcade scene – and (hopefully) making a profit at it – is very encouraging. As such, places like Game Galaxy are few and far in-between today and they need our support. Please be sure to check out the photo albums (below) that show you a virtual walk-through both the arcade and the museum. I hope you enjoy the pics and head down to Game Galaxy soon – a fellow collector I know coined Game Galaxy as “Fun Spot South”. Although not as big as FunSpot in terms of sheer size, I think a good portion of the spirit of Game Galaxy and Fun Spot are the same, so I’m good with the nickname. With continued support, I’m sure the arcade and museum will grow and that will be good news for everyone. It is definitely worth the visit. In case you missed the grand opening – no worries – DreamTR states that the museum will be open once a month (last weekend of each month, it appears) so if you weren’t able to get your game on this time around, there will be upcoming dates. Check their website to get more details! Picture walk-through of the arcade lineup on our Oct. 29th, 2011 visit. Walkthrough of the retro arcade museum lineup on opening day, Oct. 29th, 2011. This entry was posted by Whitney Roberts on November 6, 2011 at 10:31 pm, and is filed under Events. Follow any responses to this post through RSS 2.0.You can leave a response or trackback from your own site.